The CTPlaces Coalition is back, partnering to present #CTPlaces’ Advocacy Day on March 28, 2018! 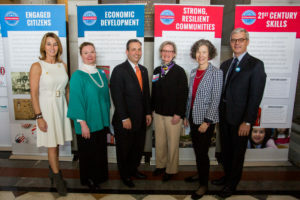 2017 Advocacy Day speakers: (l to r: House Minority Leader Themis Klarides; Lisa Perrone, District Aide for Congressman John Larson; Senate Majority Leader Bob Duff; Helen Higgins, former Interim Executive Director of CT Humanities; Katherine Kane of the Harriet Beecher Stowe Center and board president of the American Association for State & Local History; and Dan Yaeger, Executive Director of the New England Museum Association. On March 28, 2018, #CTPlaces Advocacy Day celebrates the value of history and humanities in Connecticut. Senator Duff from Norwalk will welcome everyone to the event at 11 AM. After the meeting, advocates are encouraged to visit their own legislators with their own powerful stories about their sites, and how important they are to the quality of life in their communities. Register for #CTPlaces Advocacy Day on March 28th! On Wednesday, March 28, 2018, the #CTPlaces Coalition partners with the New England Museum Association for Advocacy Day in Hartford, illustrating the importance of public investment in Connecticut humanities, libraries, museums, history, and preservation organizations. Join us to advocate for our common cause and let your representatives know what matters to you! Please RSVP here! Events will take place in Hearing Room 1A at the Legislative Office Building. Invite your legislators to attend the event, and spread the word over social media using #CTPlaces! (Page will open with Eventbrite for Advocacy Day registration).